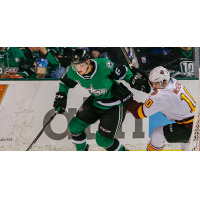 CEDAR PARK, Texas - The Texas Stars, American Hockey League affiliate of the NHL's Dallas Stars, battled the Central Division leading Chicago Wolves for the eighth and final time of the season, and came out on the wrong side of a 4-1 final. Michael Mersch was the lone Stars goal-scorer in the decision. Chicago opened scoring four and a half minutes into the game when Dylan Coghlan took advantage of his team's only chance on the power play, his first of a two-point effort. The Wolves defenseman shot a one timer through traffic in front of the crease and past Landon Bow for the opening tally. Chicago's penalty kill would end the night 2-for-2, holding the Stars on a pair of power plays.